Have a beauty-full holiday! All boxed and ready to give! America’s #1 lip gloss. 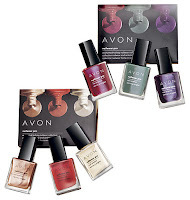 * A gorgeous gloss-ary of favorite shades in a stunning assortment of all finishes. Shades include: Apple Cinnamon, Iced Pink, Crimson, and Mocha Latte. Each, .15 oz. net wt. * Based on mass-market lip gloss unit sales. Have a beauty-full holiday! All boxed and ready to give! Dress up nails in super glossy shine with Nailwear Pro. Go for your favorite holiday classics or the season’s trendiest colors. Midnight Shimmer Collection includes shades in Cherry Jubilee, Olive, and Midnight Plum (Item #444-137). Deluxe Shine Collection includes shades in Venus, Really Red and Pale Gold (Item #502-626). Each, .4 fl. oz.